For hundreds of years, unique terroirs have been famous for their exceptional wines. From the 9th century on we find mention of the Alsace Grand Cru in historic texts. Today’s Alsace Grand Cru, an appellation defined by the INAO, is subject to strict regulations. The AOC Alsace wine named “Grand Cru” reflects a certain lifestyle: refined, tasteful and gourmand. 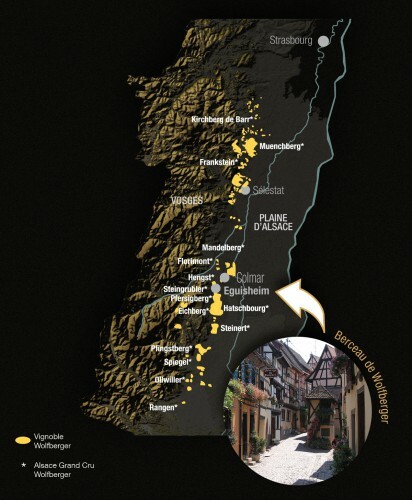 There are 51 Grands Crus in the precisely stipulated geographic zone, spread among the Alsatian vineyards. Riesling, Gewurztraminer, Pinot Gris and Muscat are the only four varieties authorized in the appellation Alsace Grand Cru. In terms of regulations, the yields and the degree of alcohol at the harvest are strictly defined. In addition, the label must show the AOC “Alsace Grand Cru” as well as mention the specific area, the varietal and the vintage. The Alsace Grands Crus are referred to by the grape varietal, like almost all Alsace wines. But in this case, more than with any other wine, the terroir determines everything. So, depending on the specific characteristics of the soil and the climate, it’s the terroir that dominates and the grapes that submit. More than all other wines, the Grands Crus d’Alsace Wolfberger remain the most refined, complex and multifaceted but undeniably surprising and original.